Federal prosecutors are scrutinizing whether employees inside and outside General Motors Co. GM +0.81% ‘s legal department concealed evidence from regulators about a faulty ignition switch, potentially delaying a recall of vehicles with the fatal problem, according to people familiar with the matter. The investigation is at an early stage, one of the people said, and it is possible that the probe could end without any charges being brought. 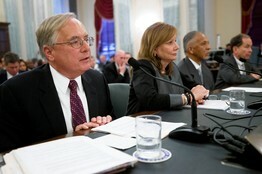 Michael Millikin, executive vice president and general counsel with General Motors Co., far left; Mary Barra, CEO of GM; Rodney O’Neal, CEO and president of Delphi Automotive PLC, and Anton Valukas, the former U.S. attorney hired by General Motors Co. to lead an internal investigation. Bloomberg News The scrutiny of GM’s legal department, which hasn’t been previously reported, follows the release of an internal GM report in June that faulted the company’s lawyers for failing to alert other managers to lawsuits against GM that could have helped resolve a pattern of accidents in which air bags failed to deploy. The legal department is just one area prosecutors are looking into for possible criminal liability, one of the people familiar with the matter said. A spokesman for the largest U.S. auto maker said the company is cooperating with the investigation. The review of current and former employees is part of a larger criminal investigation into possibly misleading statements the company made to regulators about a faulty ignition switch used in 2.6 million Cobalt and other small cars. The probe covers matters stretching back a decade and is being conducted by the Federal Bureau of Investigation and the U.S. attorney’s office in Manhattan, said the people familiar with the matter. Prosecutors are under pressure from lawmakers to hold executives at GM responsible for the long-running product defect, which the auto maker has linked to 54 accidents and at least 13 deaths. Criminal cases against in-house lawyers are rare and difficult to prove. They can be complicated by issues of attorney-client privilege. GM dismissed 15 employees including several in its legal department following an internal probe, citing their failure to take action. The company has said they received compensation packages. “You would need strong evidence,” said Carl Tobias, a professor at University of Richmond School of Law. “You’d have to show they knew the vehicle was defective, it posed serious risks, and [they] didn’t do anything anyways.” The Manhattan prosecutors’ probe is modeled on one that led Toyota Motor Corp.7203.TO +0.08% to pay $1.2 billion to settle fraud charges in March, one person briefed on the matter said. Prosecutors are investigating whether GM was aware of the faulty switch but failed to tell regulators. The Toyota penalty was the largest to date against an auto maker and ended a four-year criminal probe into that auto maker’s efforts to conceal and play down safety issues before government regulators and consumers. Toyota admitted that it had found design issues that made gas pedals “likely” to be entrapped by floor mats and had fixed such problems in Europe but told U.S. regulators there was no need to recall the vehicles. GM faces the prospect of billions of dollars in fines, legal experts said, if charged with fraud. Prosecutors could try to charge current and former GM lawyers and others with mail and wire fraud, the same charges Toyota faced, said a former official who worked on the Toyota case. But, they would need to have clear proof that the employees knew the cars were faulty and then deliberately withheld that, the former official said. The investigation could be hindered by attorney-client privilege, according to legal experts, but that privilege can be waived by GM or pierced by a “crime-fraud” exception that allows disclosure of information intended to commit or cover up a crime or fraud. GM directors got an update on the continuing probe at a two-day board meeting last week, one person familiar with the matter said. The Manhattan U.S. attorney began to look into possible criminal liability by the auto maker’s employees in early spring before an internal GM report by Anton Valukas, chairman of the Chicago law firm Jenner & Block LLP, found no concerted coverup at the auto maker in delaying the ignition-switch recall. The Valukas report concluded there was a pattern of neglect, inaction and shirking of responsibilities that kept GM from addressing the vehicle defect. It also described a secretive legal department that discouraged note-taking in meetings. Lawmakers investigating GM’s yearslong delay in recalling the cars have criticized the company’s lawyers. “Here the lawyers for GM actually enabled coverup, concealment, deceit and even fraud,” Sen. Richard Blumenthal (D., Conn.) said during a July Senate hearing. During the same hearing, Sen. Claire McCaskill, (D., Mo.) expressed outrage that Chief Executive Mary Barra had not fired the company’s general counsel. “How in the world, in the aftermath of this report, did Michael Millikin keep his job?” Ms. McCaskill asked. Mr. Millikin, 66 years old, has been with GM since 1977 and became general counsel in 2009 shortly after GM began its government-funded trip through bankruptcy court. The Valukas report concluded that Mr. Millikin was left in the dark because of the way GM handled settlements. Its lawyers typically didn’t require higher-level approvals unless the settlements reached a $5 million threshold, the report said. According to the report, members of Mr. Millikin’s staff were warned repeatedly starting in 2010 that GM could face costly, punitive damage awards over its failure to address safety problems related to the ignition defect. Mr. Millikin said during the July hearing that “we had lawyers at GM who didn’t do their jobs” and said they are no longer with the company. He also said that under a new procedure, he will personally have to review any case involving a fatality or serious bodily injury before settlement or trial. Mr. Millikin was unavailable to comment. At least three senior GM lawyers have been dismissed, and the company has hired another outside law firm, Quinn Emanuel Urquhart & Sullivan LLP, to review the way it handles litigation. The law firm didn’t respond to a request for comment. That law firm’s review is still going on, according to the person familiar with GM. —Jeff Bennett contributed to this article.